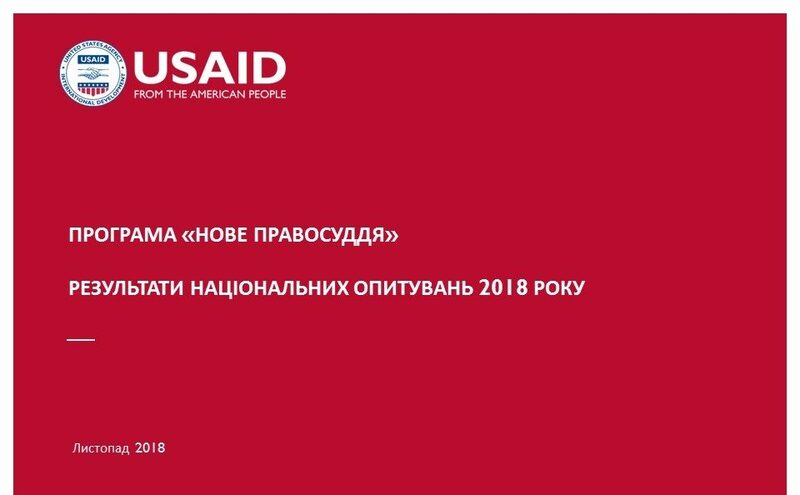 In August–October 2018, the USAID New Justice Program (New Justice) conducted a regular round of national surveys of Ukrainian public and justice sector professionals who are participants to court proceedings, but do not work in the judicial system. These surveys are conducted in cooperation with the Judicial Reform Council, High Council of Justice, and State Judicial Administration of Ukraine and contribute to achieving the program’s planned outcomes associated with support of judicial independence and accountability, prevention of corruption, administration of the court system, and access to justice. The public survey is annual, and the survey of justice sector professionals (mostly attorneys and prosecutors) is semiannual, thus, making it possible to keep track of the progress and develop recommendations for government and non-government partners of the program. Additionally, these surveys are aimed to assist the branches of Ukraine’s government with monitoring implementation of the Strategy for Reforming the Judiciary and Related Institutions for 2015-2020 (http://zakon.rada.gov.ua/laws/show/276/2015) as well as the Strategy for Sustainable Development «Ukraine 2020» (http://zakon.rada.gov.ua/laws/show/5/2015), both approved by the decrees of the President of Ukraine. 2,478 respondents participated in the national survey of Ukrainian population, the sampling is representative according to demographic data of the State Statistics Service of Ukraine. In the national survey of justice sector professionals who are participants to court proceedings 400 respondents participated. Among them – attorneys, prosecutors, in-house lawyers of government entities and businesses, and Ministry of Interior investigators. The sampling was done based on the number of cases being in the process of consideration by local courts in 2017. The level of public trust in the judiciary shows a noticeable growth in recent years: 16% of nationwide public survey respondents acknowledged that they trust fully rather trust the judiciary, which is three times as much as the critically low 5% in 2015. 21% of respondents expressed their neutral perception of the judiciary, choosing the answer “I trust and do not trust”, and 59% of respondents acknowledged that they rather do not trust or do not trust the judiciary at all. In accordance with the Eurobarometer system scale that was additionally applied this year for the first time and provides no possibility for the respondent to state his/her neutral perception, 20% of respondents tend to trust in courts, while 71% tend to distrust. The level of the legal professionals’ trust to the judiciary increased from 38% in 2017 to 41% in 2018. Meanwhile, 47% of legal professionals expressed trust in the individual courts, where they represent the interests of parties. 62% of justice sector professionals believe they know well all the provisions of the Strategy for reforming the judiciary, judicial system and related legal institutions for 2015-2020, 41% of the surveyed professionals mostly positively evaluate the progress of judicial reform. For the most part, these indicators show certain positive trends, as they were markedly lower in 2017. 16% of national survey respondents admitted that they are fully or mostly aware about the judicial reform provisions and implementation, however this indicator significantly increased since 2017 when it was only 9%. Answering the question regarding the positive impact of judicial reform on strengthening the trust of the public in the judiciary and the independence of judges, about 70% of legal professionals mention the renovation of the judiciary corps and qualification evaluation of judges as the key outcomes. In particular, the respondents consider that the competitive selection for the Supreme Court (78%), introducing the procedure of regular evaluation of judges (76%), narrowing the scope of judicial immunity to functional (68%), reversion to a tripartite system of the judiciary (64%), and derogation of powers of the President of Ukraine with regard to transfer and dismissal of judges (60%) are the positive results. 64% of the surveyed legal professionals support establishment of a new Supreme Court instead of the Supreme Court of Ukraine and three high specialized courts, 78% commend the possibility for attorneys to be candidates for judicial positions in Supreme Court and High Anti-Corruption Court and 52% approve of such opportunity for academics. Another 63% of legal professionals support granting courts powers to exercise control over the enforcement of court decisions, and 51% – elimination of the institute of initial appointment of judges for a 5-year term. In general, the assessment of certain aspects of judicial reform changed little compared with 2017. 61% of the surveyed legal professionals agree that the involvement of representatives of the international community in the process of selection of judges of the High Anti-Corruption Court is justified, and 45% of them think that it is justified to involve representatives of the public (Public Integrity Council) in the selection of justices of the Supreme Court. The national survey of Ukrainian citizens showed that 9% of all respondents experienced participation in court proceedings in the last 24 months. This is a much larger percentage that the last year’s one (as little as 5%). 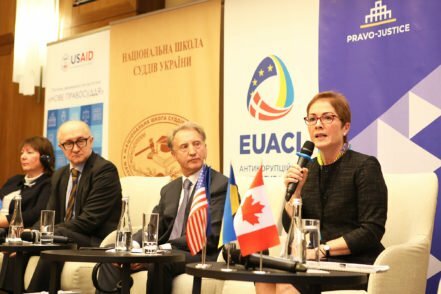 Trust in the judiciary among Ukrainians who participated in court hearings is twice as high as among Ukrainians in general, who mostly receive information on judiciary from the news. In the course of four years, the trust of the Ukrainians – participants to court proceedings – also has a tendency to increase – from 16% in 2015 to 34% in 2018. 60% of citizens – participants in court proceedings agree that the level of professional qualification of judges was proper, 63% – that the judges were polite and tactful. In addition, 59% admitted that the work of the court was well-organized, and 53% – that cases were heard timely and without delays. 54% of the participants in trials agreed that there were no requests for bribes and other corruption practices, and 44% – that judges passed fair decisions. For the most part, these indicators show certain positive trends, as they were notably lower in 2017. However, 42% of citizens that had court experience acknowledged that they had problems and they had to use their ties, acquaintances and other means of influence which is significantly higher than in 2017, when this indicator was 33%. 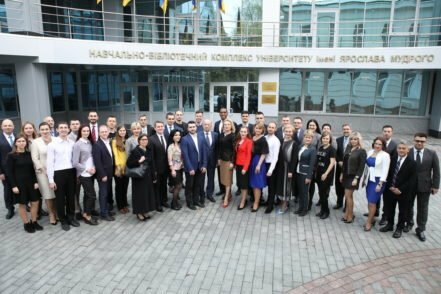 The legal professionals’ perception of judicial system in Ukraine is on the whole somewhat different from their perception of the operation of specific courts, where they represent the parties. 48% of the respondents believe that information about court proceedings and the progress of a case consideration is accessible and understandable for citizens. 46% of them believe that the level of professional qualifications of judges in general in Ukraine is proper, 29% consider that judges always make lawful and fair decisions, and 20% believe that Ukrainian citizens trust the courts. Summarizing their own impressions of court proceedings for the last 12 months 61% of legal professionals who are participants to court proceedings believe that the level of professional qualification of judges is proper, and 53% think that judges pass lawful and fair decisions. 70% recognize that judges were polite and correct with all participants of court proceedings and 71% say that there were no requests for bribes, unofficial payments or other instances of corruption. It should be noted that these indicators show some negative trends, as they were markedly higher in 2017. 53% of the surveyed legal professionals admit having experience in applying to the disciplinary bodies regarding the actions of a judge on and off the bench. 44% of them admitted using the institute of a disciplinary complaint against a judge to prevent delays in litigation and (or) other procedural violations during the trial. 59% of respondents believe that the participation of jurors in the administration of justice is the key to raising the level of public trust in the judiciary. Of those who believe this, 47% agree that the participation of jurors contributes to a fair trial, and 31% that such participation prevents corruption in courts. 19% of respondents in the national survey expressed their willingness to be jurors in court processes, and 72% stated that they did not have such a desire. The main reasons for the respondents’ willingness to be jurors are the opportunity to promote fair justice and the possibility to prevent corruption in courts. The main reasons for the unwillingness of Ukrainians to be jurors in courts are a lack of legal knowledge and lack of time. 79% of respondents are aware that the institute of private enforcement officers has been introduced, 22% of them sought services of private enforcement officers. 65% of respondents believe that it is dangerous to be a whistleblower in Ukraine, 49% believe that the judicial system of Ukraine can become a basis for fighting corruption in all branches of power, 46% consider the creation of the National Anti-Corruption Bureau of Ukraine (NABU) as a necessary step made by Ukraine, while 42% of respondents think that creation of the High Anti-Corruption Court will have a positive impact on curbing corruption. 57% of surveyed legal professionals agree that the judge who has information about corruption actions of his/her colleagues should notify the NABU about this, but 63% of respondents think that judge who reveals corrupt actions of his/her peers jeopardizes his/her career. Besides only 13% of surveyed legal professionals admitted that they themselves will notify the NABU if they have information which indisputably affirmed that the judge or colleague-prosecutor demanded a bribe from a litigant.